Ali Ramirez knows that baking is in her blood. For as long as she can remember, she’s spent every afternoon helping her father in their family bakery, Say It With Flour. But when Perk Up, a hugely successful coffeehouse, opens up across the street from their bakery, it means trouble. Perk Up’s baked goods are trendy and delish, and Say It With Flour just can’t compete. But then Ali convinces her dad to try cake pops in the bakery and they’re a huge hit. There’s only one problem: Dane McGuire. He’s cute, smart, and as the son of Perk Up’s CEO, he’s her biggest rival. Ali can’t stand him, especially when she discovers that he’s making cake pops for Perk Up that are outselling hers by the dozens. Ali knows the only way to save Say It With Flour is to outbake Dane at any cost. Dane swears he’s not her enemy, though, and sometimes he can be disarmingly sweet. But if Ali loses her heart to Dane, will she lose her beloved bakery as well? She paused, and my heart clattered wildly. Catering the dessert for Sarah’s party would give Say It With Flour a huge boost. “Try out?” I asked, trying to keep my voice on an even keel. Suddenly my excitement shriveled into fear. Had she just said something about baking without a recipe?…I swallowed down my rising panic, then forced another smile. “Yeah, it does sound like fun,” I replied weakly. “Okay. I’ll be in touch!” Then she glided down the hallway, tossing smiles and shining hair in all directions. I tried to muster up a smile, but I didn’t have it in me. Experiments in baking? Yeah right. For someone who hated winging it, it would be experiments in torture. 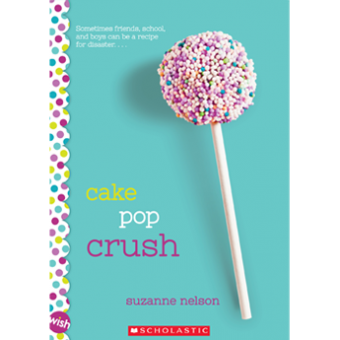 Cake Pop Crush is a new book, available for purchase in bookstores and online!